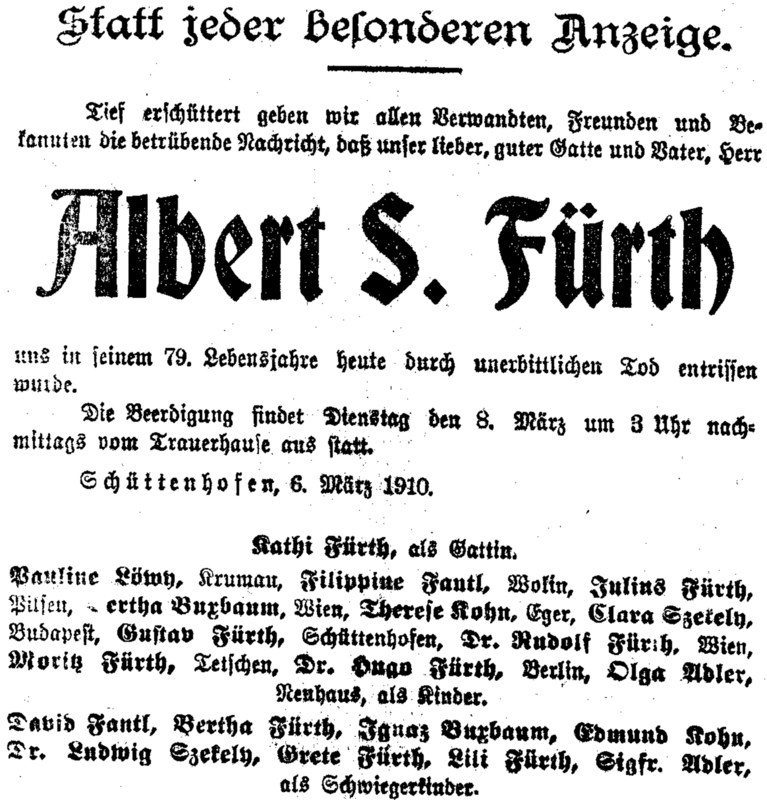 Note: see History of the Fürth family Adobe document ".. 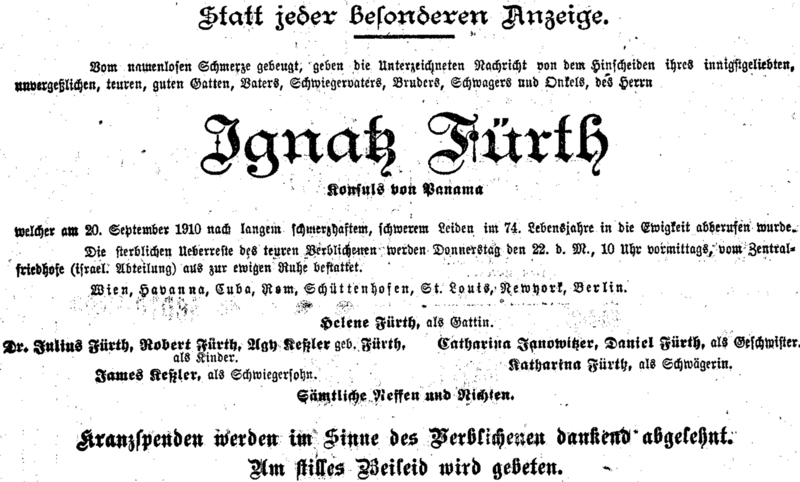 The name Fürth was first mentioned in the archives of Bohemia in 1616. 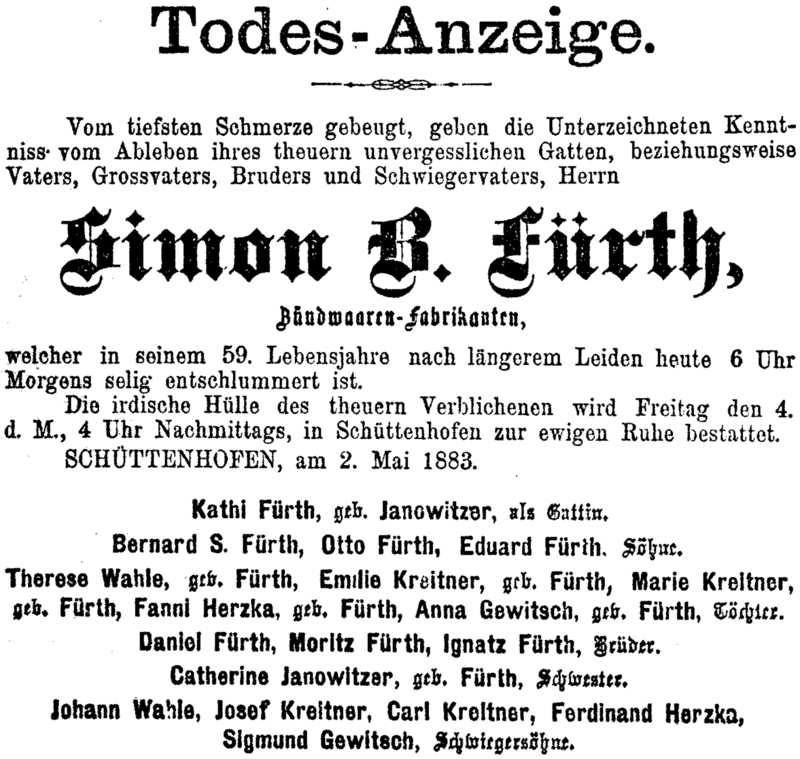 A document dating from the beginning of the 18th Century reveals that one Smüel Fürth and his wife Gürtel lived in 1630. Lazar Fürth and his wife Anna were living there in 1690. 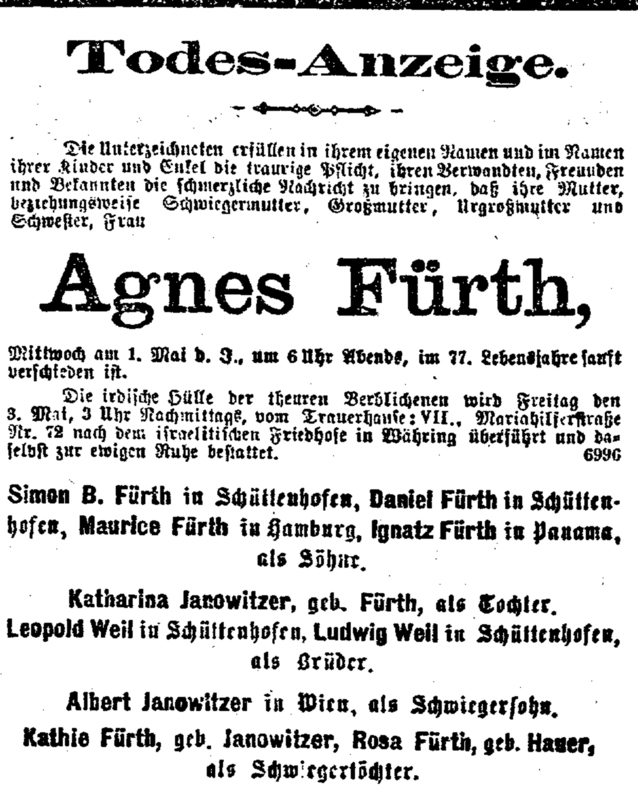 In 1696 Samuel Fürth and his wife Jettla and Isak and Hennele Fürth lived there.. 1783 census has only one Fürth living in Sušice, Daniel Fürth, a "Schnittenwahren- und Tabakhändler" (a trader in wood carved products and tobacco).." OR 1793 census has below Dawid Fürth, Lazar Fürth living in Sušice, as well as Daniel Fürth (abt 1742 -), Samuel Fürth (abt 1748 -), Markus Fürth (abt 1758 -) & Sara Kohn ( m. 1791 - ) marriage witnesses Daniel and Dawid Fürth. They could all have been brothers of Dawid and Lazar or 1st cousins? Note: Fürth family ".. Joachim Popper was ennobled, presumably around the middle to end of the seventeenth century. 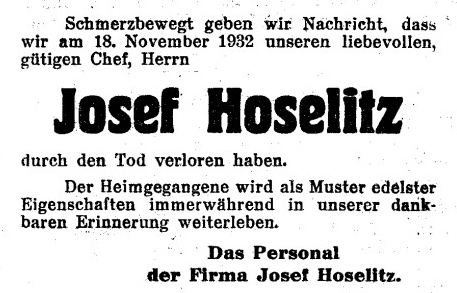 I anticipate here but, following Emil’s move to Vienna in 1915, he was managing director of a large Austrian company, Leykam Josefstal AG, whose board chairman was one Baron Popper von Artberg – could it have been that Emil was descended from Chaile Popper and Baron Popper from Joachim Popper?.. 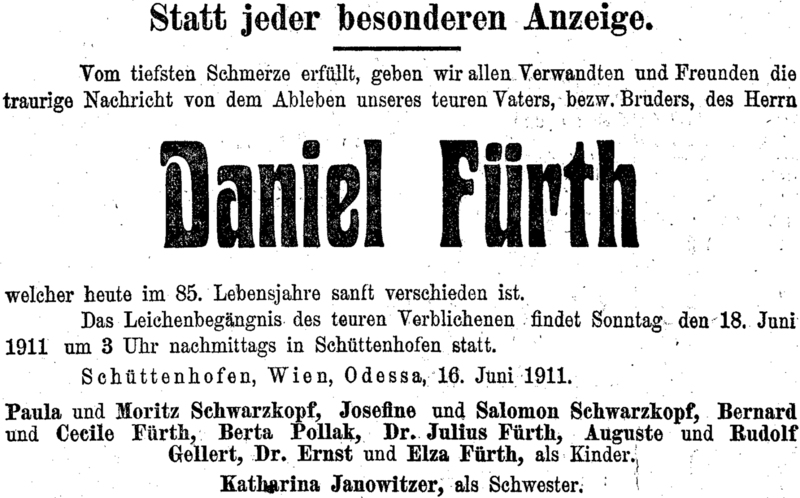 1793 census had David Fürth living in Sušice with his wife Rosalie and children, as well as widow with her children, one Rachel (nee Fürth) Lederer (probable sister of David) and a house-teacher Natan Bamberger.."
Emma FÜRTH	Born: 11 Aug 1866 in Sušice. Died: 1928 in New Jersey, USA	age 62 est. Nelly S FÜRTH	Born: 1875	Died: 1893 in Honesdale, PA age 18 est. 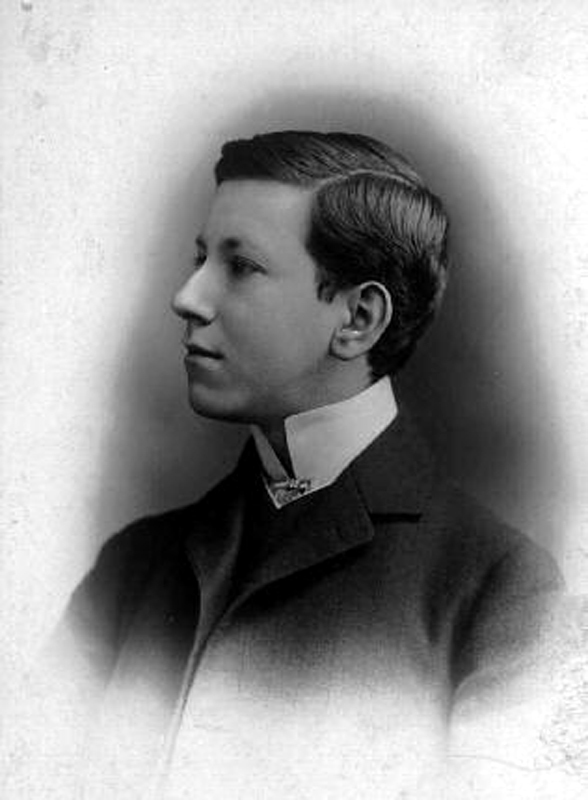 William Bernhard FÜRTH	Born: 29 Apr 1881 in Manhattan, New York. Died: Mar 1964 in New York, NY age 82 est. 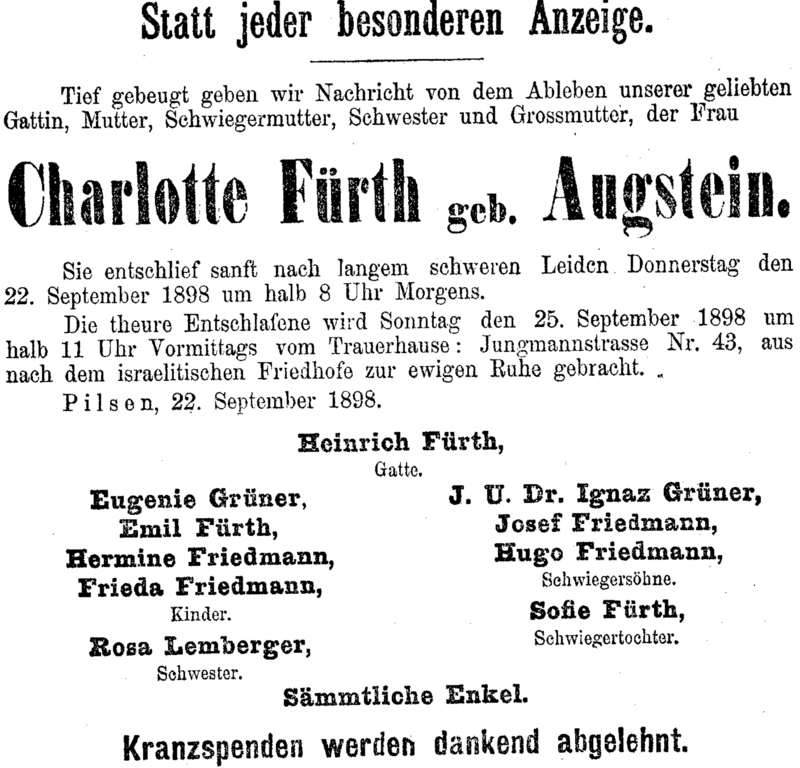 Katharina FÜRTH	Born: abt. 1815 in Sušice,	Bohemia. Died: 20 Dec 1885 in Prague, Bohemia age 70 est + Michael GRATUM	Born: 1807 in Beroun, Bohemia. Died: 1 Feb 1881 in Prague	age 74 est. 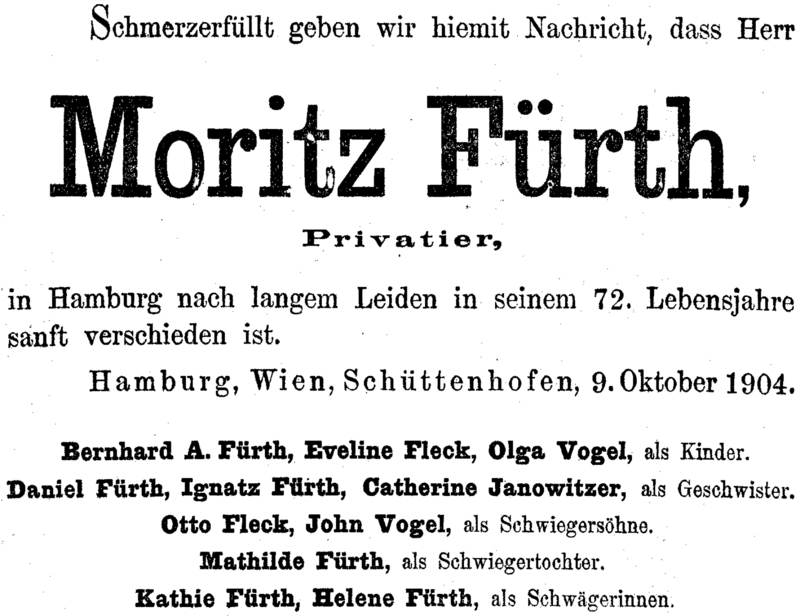 *any relation to Josef Gratum (1801 -) & Katharina Fürth (5/1808 #9 Kosová Horá - ) daughter of Seligman Fürth & 2nd wife Lea (Lida, Ludmilla, Lisl) Robitschek on Pick page? 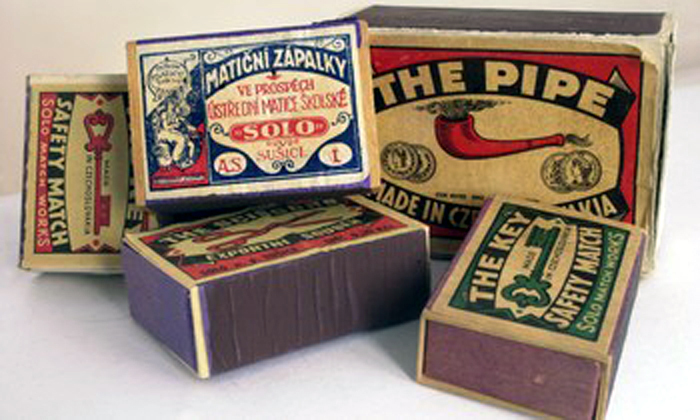 Gertrud EISNER	Born: 1887 in Prague. Died: 13 Jun 1893 in Prague	age 6 est. *2nd husband of Lydia Fürth: William (Willy, Wilhelm Kurt) BOHMER	Born: 9 Jan 1916 in Vienna. 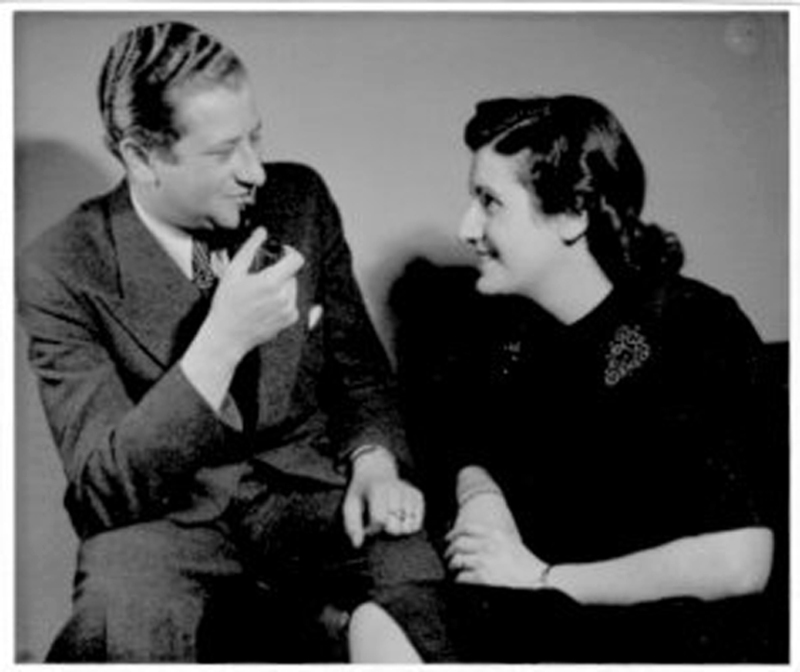 Married: 1937 in Vienna. occupation: Shoemaker, later Merchant in Jewellery. Died: Jun 1977 in New York age 61 est. Hans FÖRSTER	Born: 1908 in Oświęcim (Auschwitz), Poland. occupation: Textiles Merchant. Died: abt. 1943 in Poland age 35 est. Otto Isak "Otto" FÜRTH	Born: 20 May 1890 in Kolešovice (Kolleschowitz), Bohemia,	Czech. 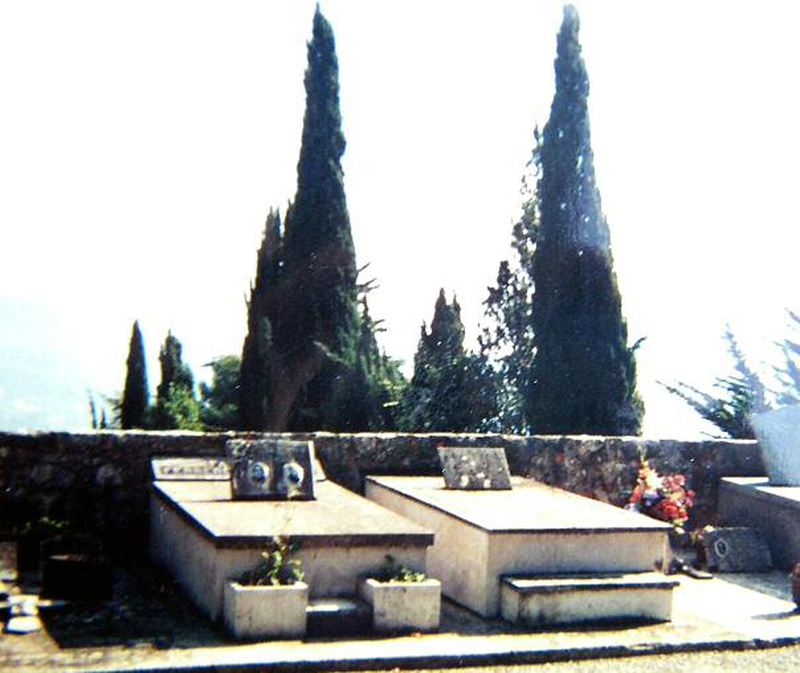 Died: 1962 in Tel Aviv, Israel age 72 est + Elfriede "Frieda (Channa)" KOHN	Born: 1899 in Turnov (Turnau), Bohemia. Married: 10 Jul 1921 in Prague, Bohemia. Died: Jun 1987 in Tel Aviv	age 88 est. 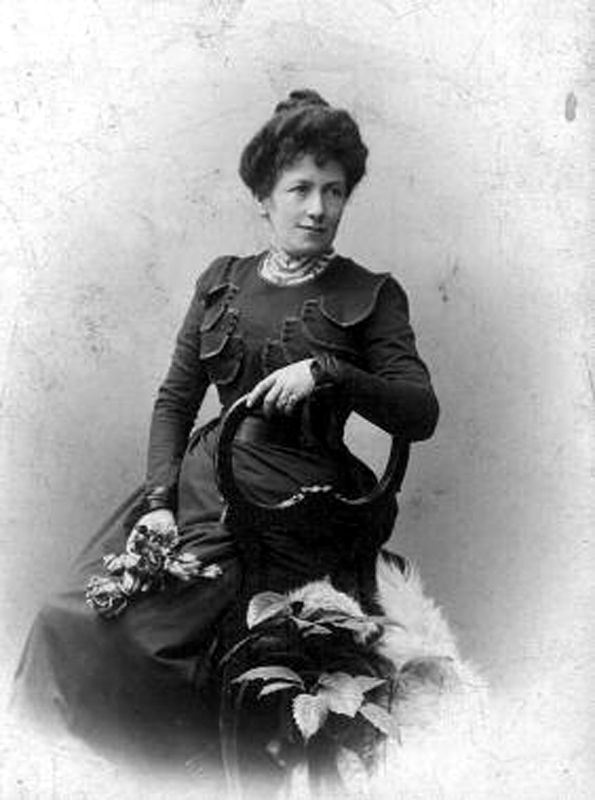 Theresia "Rezi" FÜRTH	Born: 5 Feb 1855 in Sušice,	Bohemia. Died: 8 Nov 1942 in Terezín (Theresienstadt) concentration camp, Czech age 87 + Salomon WEISSKOPF	Born: abt. 1850 in Horažďovice (Horazdowitz),	Bohemia. Married: 26 Nov 1878 in Sušice. Died: 21 Feb 1917 in Horažďovice age 67 est. 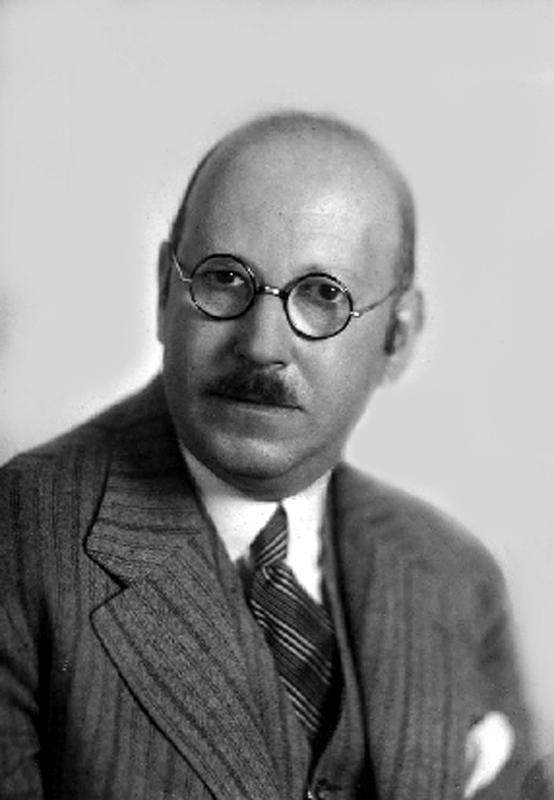 Karl (Karel) WEISSKOPF	Born: 26 Feb 1880 in Horažďovice, Bohemia. Died: 25 Apr 1942 in Warsaw, Poland	age 62 + Irma STEIN	Born: Aug 1888 in Dolany (Dolan), Czech. 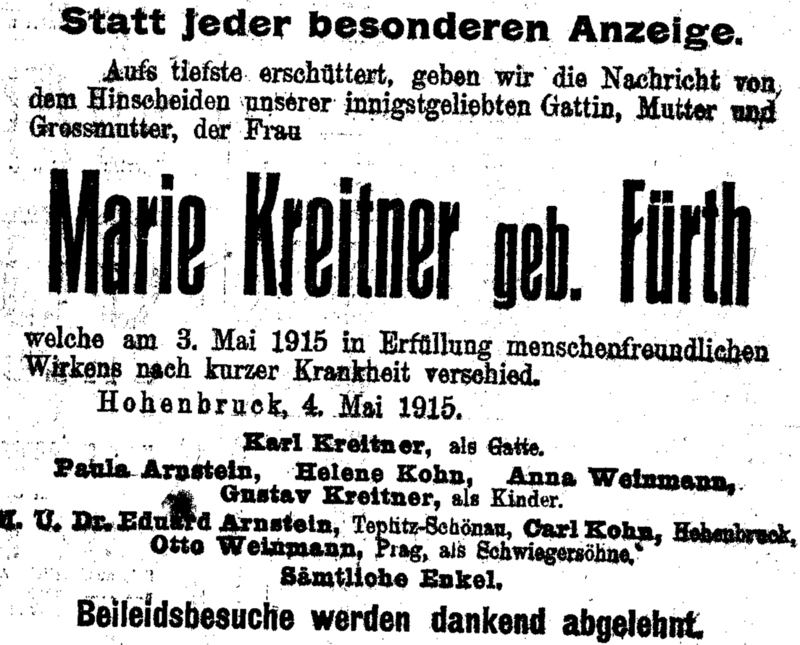 Married: 27 Mar 1910 in Horažďovice, Bohemia. Died: 25 Apr 1942 in Warsaw age 53 est. Rudolf WEISSKOPF	Born: 7 Dec 1885 in Horažďovice, Bohemia. Died: Jan 1968 in Long Island City, Queens, New York	age 82 est + Ida (?) Born: abt. 1878 in Kolín, Bohemia. Died: bef. 1948 in USA	age 70 est. *2nd wife of Rudolf Weisskopf: Hetty (?) Born: 23 Aug 1897	Married: 1948 in USA. Died: Sep 1979 in New York, N Y age 82 est. Karl "Karel" FANTL	Born: 9 Aug 1922 in Horažďovice, Bohemia. Died: 1944 in Auschwitz, Poland	age 22 est. Paula WEISSKOPF	Born: 30 Apr 1891 in Horažďovice, Bohemia. Died: Feb 1980 in New York age 88 est + Isidor Albert POPPER	Born: 14 Sep 1885 in Rakovnik (Rakonitz), Bohemia. Married: 20 Nov 1919 in New York US	occupation: 1913: Engineer; 1922: Merchant in Surgeon Instruments. Died: Apr 1974 in New York, N Y	age 88 est. 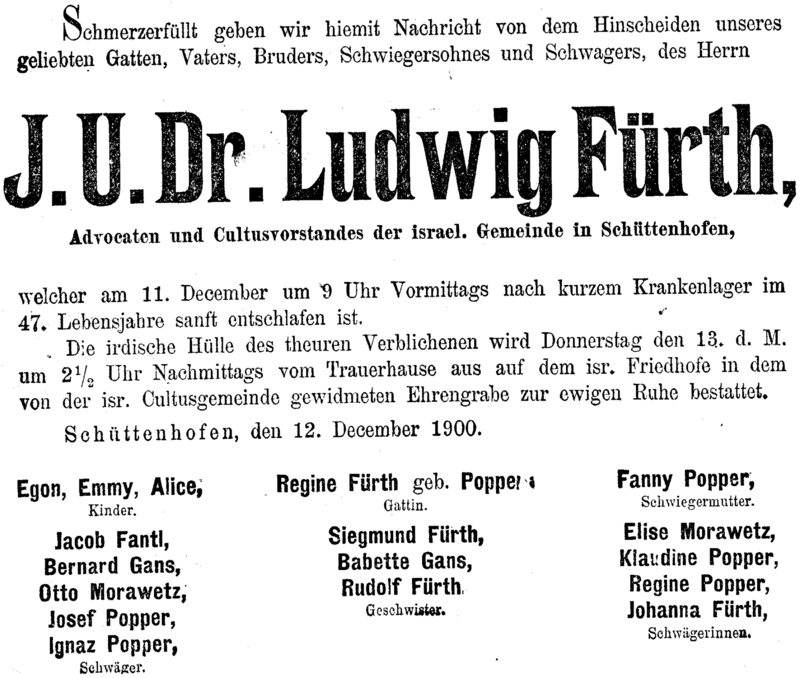 Sigmund FÜRTH	Born: 11 Oct 1854 in Sušice, Bohemia. 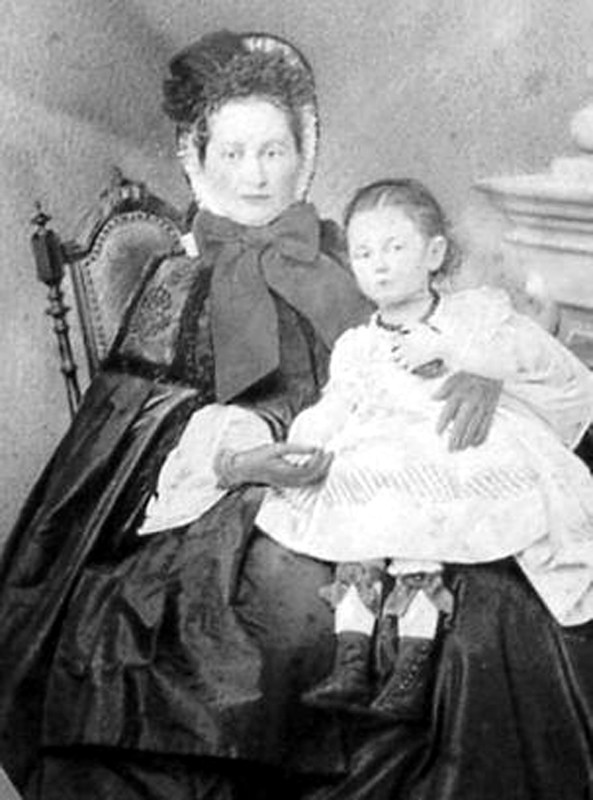 Died: 26 Nov 1920 in Prague, Bohemia age 66 + Phillipine STEINDLER	Born: 30 Dec 1864 in Český Dub (Böhmisch Aicha), Bohemia. Married: 29 Jun 1891 in Sušice	Died: 1956 in Prague	age 92 est. 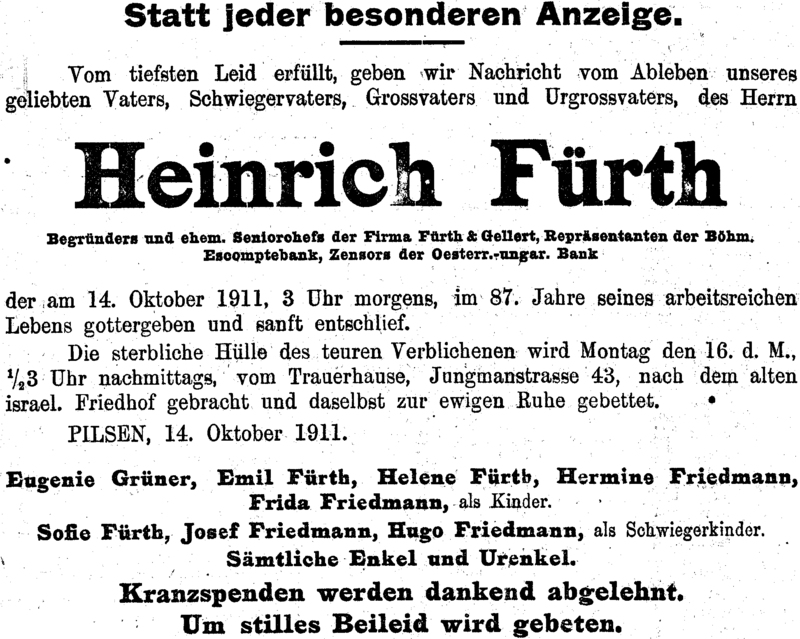 Helene FÜRTH	Born: 18 Aug 1893 in Sušice, Bohemia. Died: Oct 1944 in Auschwitz, Poland	age 51 est. 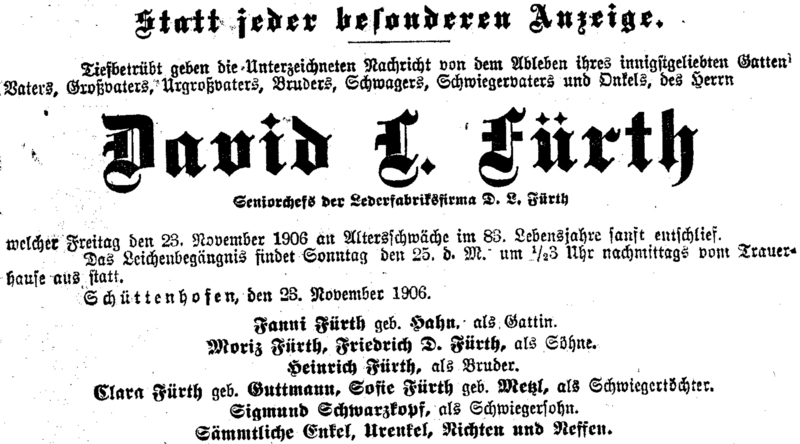 Fanni FÜRTH	Born: 6 Nov 1814 in Sušice, Bohemia. Died: bef. 6 Oct 1830	age 15 est. Ruth Anina FÜRTH	Born: 4 Oct 1921 in Prague, Bohemia. Died: Jan 1943 in Oświęcim (Auschwitz)	concentration camp, Poland age 21 est. Ernst Arnost FÜRTH	Born: 27 Feb 1890 in Sušice,	Bohemia. occupation: Factory Owner. 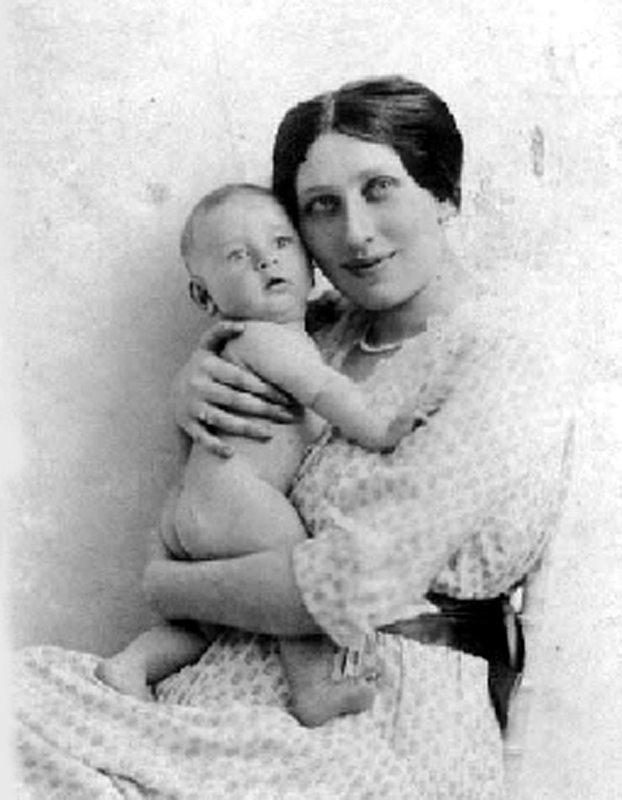 Died: 20 Jan 1943 in Auschwitz	concentration camp, Poland	age 52 + Irma FREUND Born: 4 Apr 1893 in Tábor, Bohemia. Married: 1917	Died: Jan 1943 in Auschwitz camp	age 49 est. 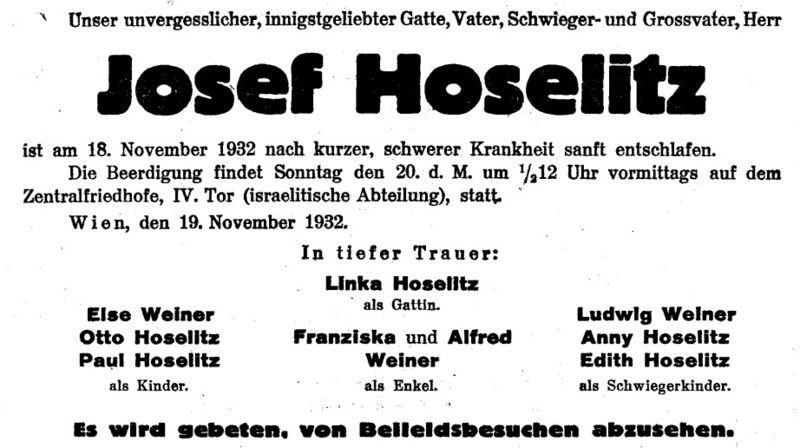 *2nd husband of Mirjam Fürth: Jiri Jizhak KRAUSS	Born: 1904 in Hompoletz =Humpolec?, Bohemia. Married: Jun 1948 in Czech. Died: Aug 1974 in Haifa, Israel age 70 est. Karel FÜRTH	Born: 17 Feb 1927 in Sušice, Bohemia. Died: Jan 1943 in Auschwitz camp, Poland age 15 est. 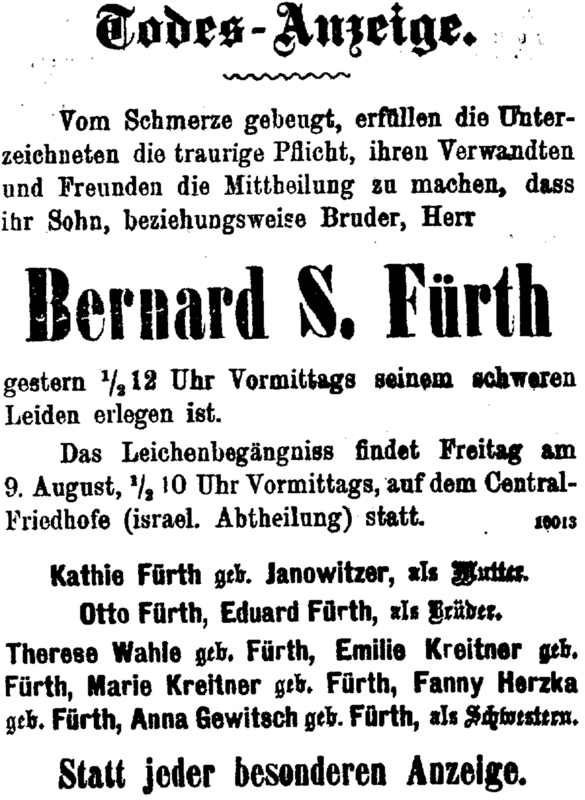 Emma (Emilie) FÜRTH	Born: 2 Feb 1892 in Sušice, Bohemia. 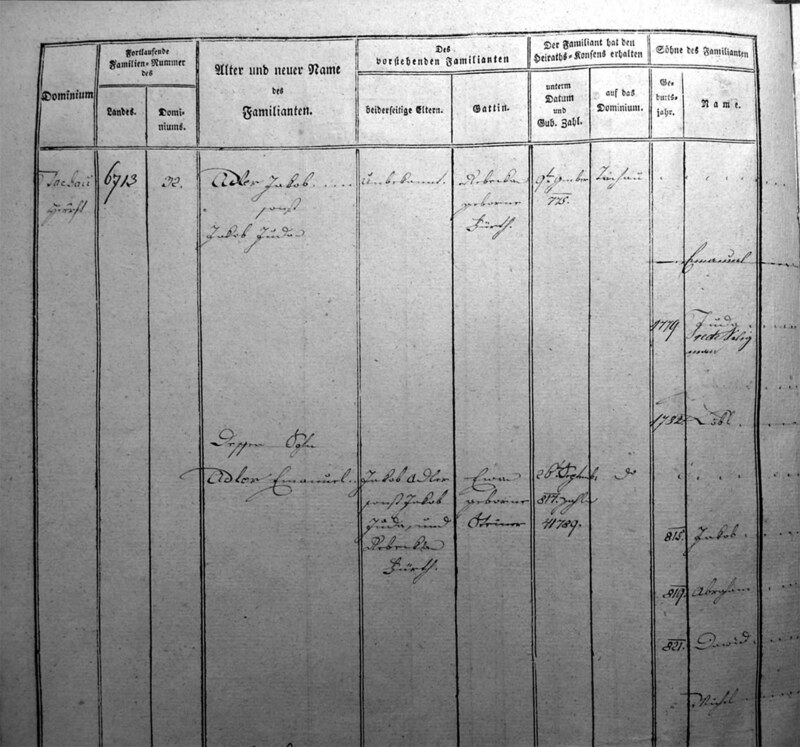 Died: Jan 1943 in Auschwitz	camp, Poland age 50 est + Siegmund (Zikmund) RECHTS Born: 1 Jul 1882 in Plzeň (Pilsen vicinity), Bohemia. Married: abt. 1917 in Sušice,	Bohemia. occupation: Leather Shoe Merchant. Died: Jan 1943 in Auschwitz	camp age 60 est. Herbert RECHTS	Born: 30 Aug 1918 in Vienna, Austria. occupation: Doctorial Studies of Medicine. Died: Feb 1943 in Auschwitz	camp age 24 est. Zedenek "Zdeno" RECHTS	Born: 7 Nov 1919 in Prague, Bohemia. Died: Jan 1943 in Auschwitz	camp, Poland age 23 est. Hermine FÜRTH	Born: 20 May 1894 in Sušice,	Bohemia. Died: Feb 1943 in Auschwitz	camp, Poland age 48 est + Dr. Ludwig FUCHS	Born: 12 Apr 1882 in Trhová Kamenice, Bohemia. occupation: Medical Doctor. Died: Feb 1943 in Auschwitz	camp, Poland age 60 est. 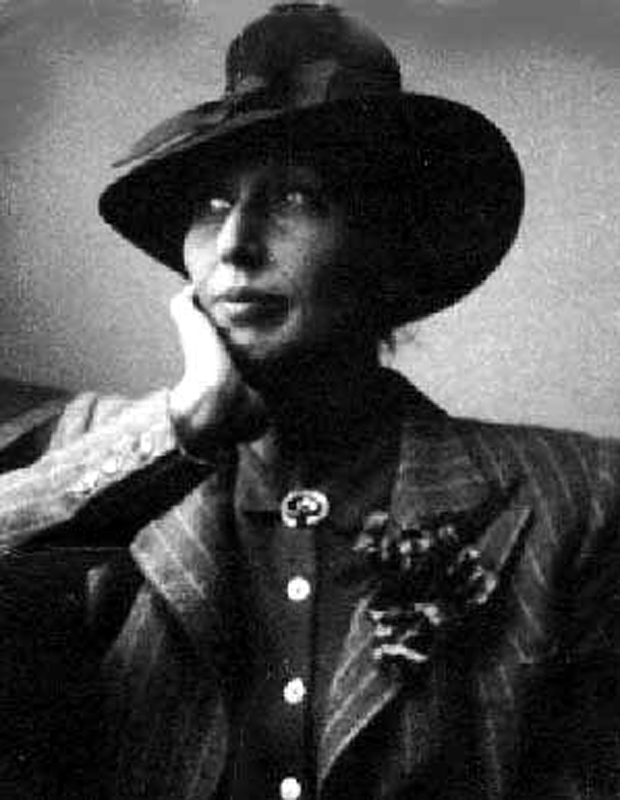 Helene FUCHS	Born: 4 Nov 1918 in Český Krumlov (Böhmisch Krummau),	Bohemia. Died: Oct 1942 in Treblinka concentration camp, Poland age 23 est. Hana Jana Milena FUCHS	Born: 20 Jan 1924 in Český Krumlov, Bohemia. Died: Feb 1943 in Auschwitz	camp, Poland age 19 est. Hanna WEINER	Born: 28 Apr 1913 in Klatovy, Bohemia. Died: abt. 1942 in Izbica camp, Poland age 29 est	+ Felix STEIN	Born: 3 Jan 1901	Died: abt. 1942 in Izbica age 41 est. Else WEINER	Born: 20 Nov 1888 in Klatovy, Bohemia. Died: 12 Dec 1940 in Brno (Brünn), Bohemia age 52 + Josef FANTL	Born: 26 May 1876 in Jindřichův Hradec (Neuhaus), Bohemia. occupation: Managing Director (Direktor) Filial der Wiener Bank-Verein. Died: 1942 in Sobibor (Ossawa) concentration camp, Poland	age 66 est. Hana TAUSSIK	Born: 13 Jan 1912 in Prague,	Bohemia. Died: Nov 1974 in St Marylebone, London, England age 62 est + Otto RUDINGER	Born: 8 Nov 1901	Died: Dec 1988 in Middlesex, England	age 87 est. 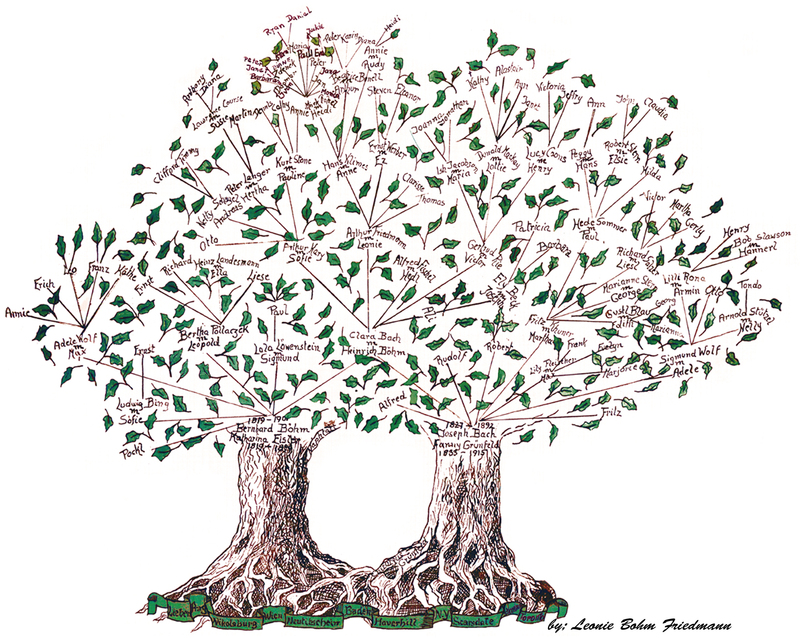 Alfred WEINER	Born: 8 Jan 1922 in Vienna, Austria. occupation: Exporter. Died: Feb 1988 in Bergen, New Jersey, USA	age 66 est. Robert FÜRTH	Born: Apr 1900 in Sušice, Bohemia. Died: Feb 1901 in Sušice	age 0 est. Cordelia FÜRTH	Born: 4 Mar 1854 in Sušice, Bohemia. Died: Bef. 1860 in Sušice	age 6 est. 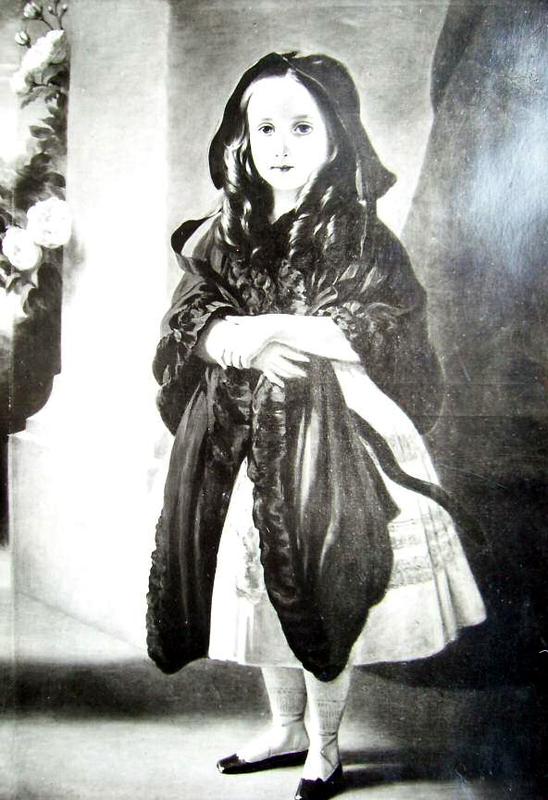 Liselotte (Lisa Lotte) GRÜNER	Born: 17 Jan 1910 in Teplice, Bohemia. Died: aft. 16 Dec 1940 in Saratov, Russia	age 30 est. Anne "Annie" GLASER	Born: 5 Sep 1905 in Žatec (Saaz), Bohemia? Died: Sep 1988 in Westminster London, England age 83 est. 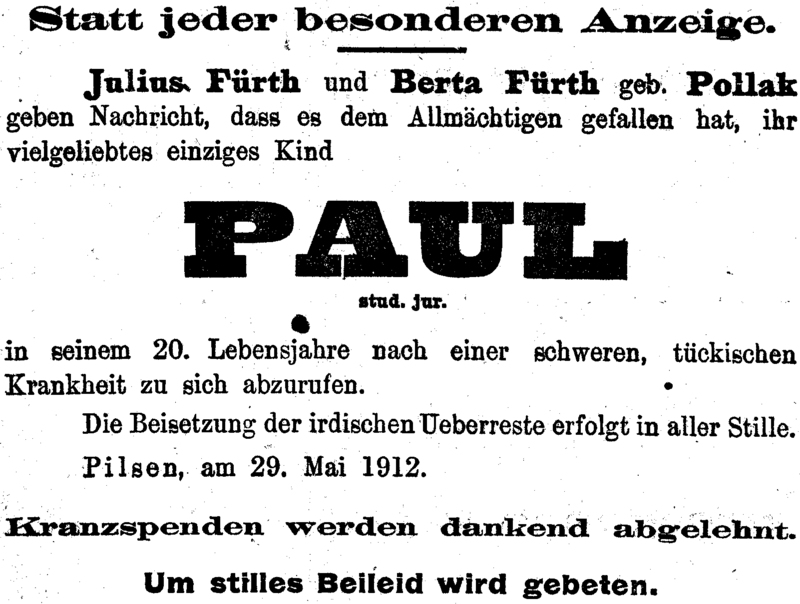 Note: see The writings.pdf of Emil Fürth ".. June 27, 1914 Emil acquired the pulp and paper mill at Nestersitz from Mr. August Brune.. It was at this point in 1925 that Mr. Hermann Salzer turned up on my doorstep.. I had been pleasantly acquainted with Mr. Salzer, the co-owner of the reputable paper making company, Salzer & Hetzer in Obereggendorf.. Mr. Salzer showed full understanding for the reasons for my negative response, and then proceeded to set up the Obereggendorf Paper Mill Joint Stock Company.. 1927 I didn’t heed Stefan’s anxious pleading that I should suppress any attempt to get the bank to lower the offer it made me and I was in fact able to obtain a price reduction. I wish the negotiations had failed because this acquisition proved to be the third and largest disappointment of my life.."
Dr. Lester E. FISHER Born: private *appeared on the Ray Raynor show and Bozo's Circus with a weekly segment known as the Ark in the Park. ref.
? Isak KOSCHERAK occupation: merchant in Vrbova Lhota, Bohemia. + Theresia FREUND of Chvalovitz ?= Chanovice (Chanowitz), Bohemia *source Thomas Fürth, great-grandson of Veronika or is Mr. Stein the great-grandson?